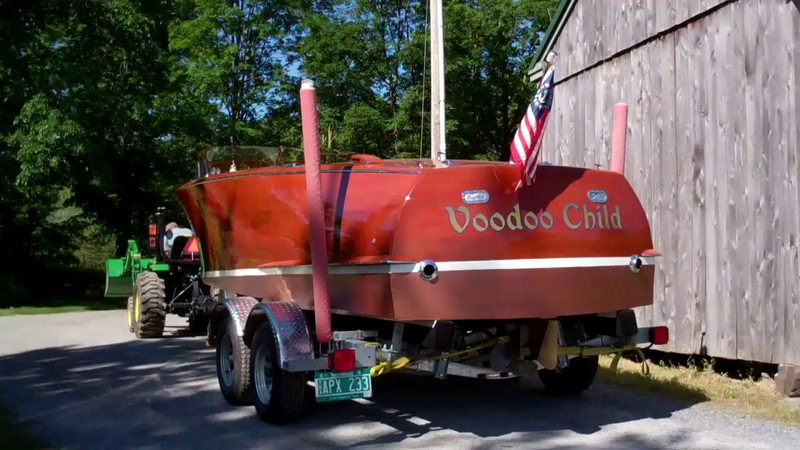 Voodoo Child arrived here from Pointe au Beril, Ontario, CA on October 27, 2015. Now, some twenty months later, she is leaving her comprehensive preservation process in her wake. Save for a new RAYCO tank, new bottom inner skin and updated upholstery, nothing from her Model 110-S, dual quad four, 331 cubic inch, V-drive Hemi to the smallest piece of hardware has been replaced. Every piece of wood, inside and out, was stripped bare and sealed with three coats of CPES. Robert Henkel, Peter Henkel, Inc., Marine City, MI, executed a complete mechanical and cosmetic tear-down and re-build. Mickey Dupuis, Custom Metal Restoration, Holyoke, MA, transformed her hardware into jewelry, as is his only standard. Shauna, Kocian Instruments, MN, restored the gauge panel and gauges to show quality without switching out any of the gauges. We stripped her hull to bare wood, sanded it fair and applied a new finish, the final step of which was buffing her twenty coats of Pettit Hi-Build varnish. Soon she will live on her new ShoreStation lift that is complete with a vertical shade panel so that she need not roast under a mooring cover. “All” we need to do now is test her, execute some final tweaks and correct any issues that pop up during her sea trial, oh, and finish assembling the lift. Shirley and I cannot wait!